The Waiting List improvements were built so you can see more patients and save time managing tentative appointments. Simply go to the Waiting List page and click Add to Waiting List. You can add the patient details (new or existing), select location, and practitioner according to the patient's preferences. There's the option to choose the days of the week and times of the day that are more convenient for the patient. You can mark if the appointment needed is urgent as well as remove the patient from the waiting list if the appointment is no longer required after a period of time. 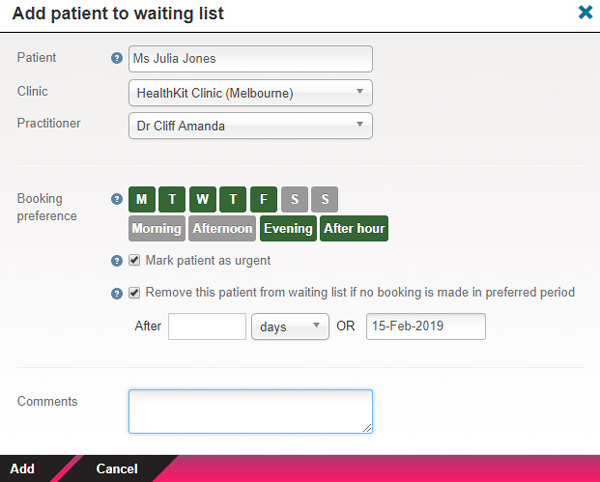 Click on the Waiting List button on the top of your calendar to add patients details and appointment preferences to the waiting list – in the same way as described in section 1. If the patient has a particular date and time they'd like to see you but the appointment is taken, click on the desired time slot, create an appointment and select Waiting List as the status. If the desired time slot becomes available, you can send an invite to the patient to attend the appointment. You'll be able to send an email or SMS (one-way or two-way, if you have enabled this option) to notify the patient of the newly-created appointment. 3. Enter the appointment details and save. Global health technology entrepreneur and Co-Founder of HealthKit, the first global health platform for practitioners and patients anywhere in the world. New Campaigns feature: Send mass email and/or SMS communications to your patients. In the week the world celebrates love, we’ve decided to announce some great news for you and your practice: we have new lower rates for auto payments! If you're not yet using two-way SMS reminders to update the colour of your appointment status automatically, you now also have the option to show or hide the status colours manually.